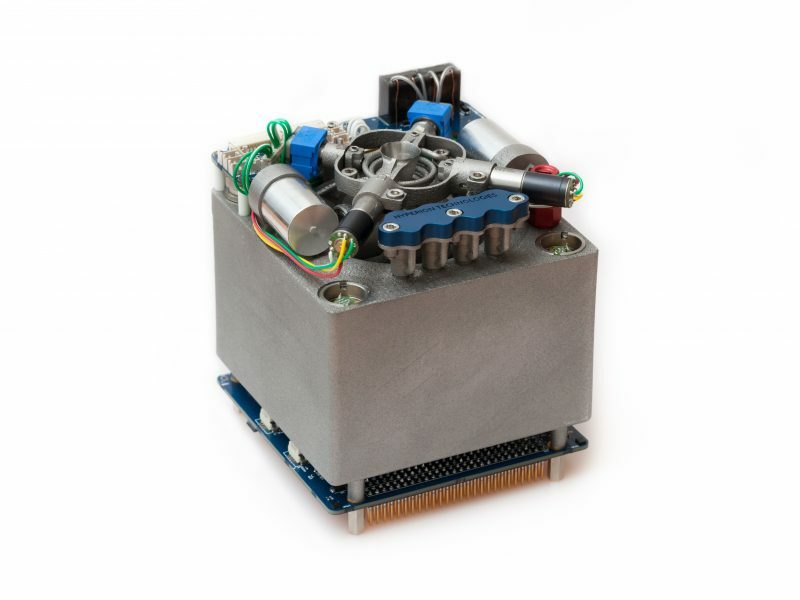 The PM200 brings high thrust propulsion capability to 3-12U CubeSats and similar platforms. Low system complexity and zero propellant toxicity allow for simple and robust operations, both on the ground and when in orbit. The medium tank pressure and high storage density of liquid propellants enable high safety factor tanks to be used with little mass penalty. The standard 1U configuration of the PM200 propulsion module can deliver in excess of 230 m/s of velocity increment to a 3U CubeSat of 4 kg at a nominal thrust level of 0.5 N.
The PM200 offers active thrust vector control to minimize disturbance torque on the satellite platform and can be seamlessly integrated with the iADCS400 to provide a fully integrated GNC and ADCS solution.